On this Top of Switzerland tour, witness some of Switzerland's most amazing scenery and learn about traditional and current Swiss culture with overnights in Zurich, Interlaken, and Lucerne. Plus, you'll travel to Germany and overnight in Munich and the charming Bavarian town of Oberammergau. A tour highlight is your rack railway trip to the "Top of Europe," a high alpine wonderland of ice and snow. Here, at the amazing Jungfraujoch, Europe's highest railway station at 11,332 feet, you can stand on the observation platform to view the glaciers and witness a panoramic view overlooking France, Germany, and Italy. It's an unforgettable experience! Participate in a walking tour in Lucerne, walks through the Old Town in Innsbruck and Zurich, and an orientation in Munich. 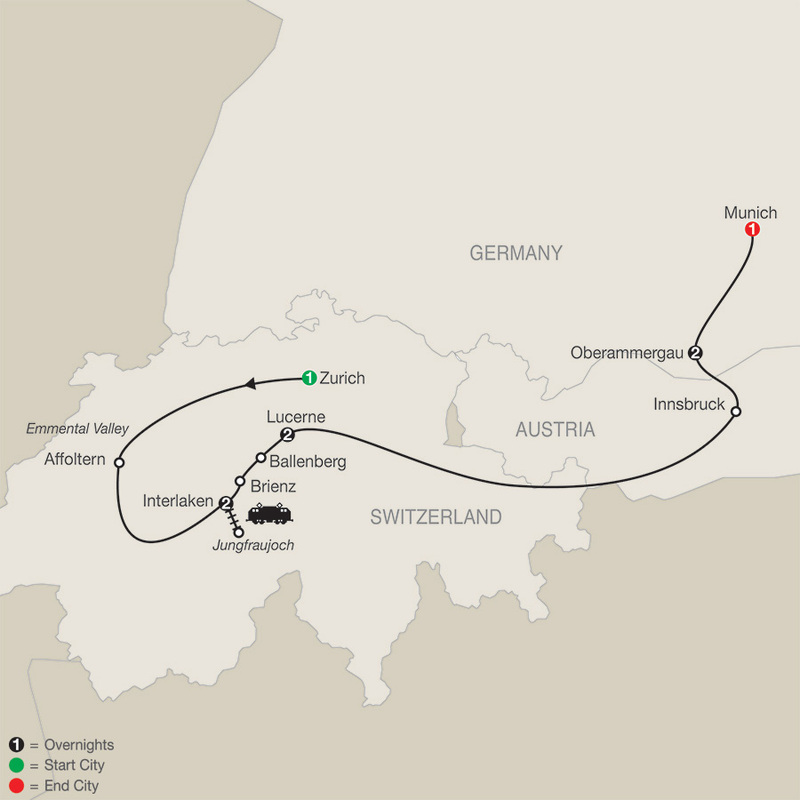 In Oberammergau, enjoy first-class seats to the Passion Play, performed every 10 years by Oberammergau residents as a thank you for saving the town from the Black Death. With beautiful alpine scenery as the backdrop, it 's a once-in-a-lifetime experience. Globus has also included special treats to help you learn about Swiss culture. Visit the Ballenberg Open-air Museum to see traditional rural buildings from all regions of Switzerland and to learn how Switzerland 's rural populations have lived, worked, and kept their customs alive. Woodcarving is part of the Swiss culture and in Brienz, visit the Woodcarving Museum to see traditional and artistically significant woodcarvings. Also visit a little cheese village in the Emmental Valley to learn about traditional and modern cheese production techniques, sample the locally produced cheese, and enjoy a light lunch. From the gorgeous scenery to the unique cultural experiences, this Switzerland tour with Oberammergau is a dream vacation!